*In this recipe, you’ll only be using half of the batch of bread dough, but since measurements get awkward if you try to cut the recipe in half, I always make the whole batch and use the remainder for hamburger buns, dinner rolls, or a loaf of bread. Follow bread dough instructions through the first proof. After punching down, cut the dough in half (use the second half for another batch of caramel rolls or to make a loaf of bread or about 12 buns). Take the dough and roll it into a large rectangle, approximately 8x12 inches. Spread the surface of the dough with butter. Then sprinkle the remaining ½ cup brown sugar and cinnamon over the top. On one long side, begin rolling the dough tightly into a log to slice into rolls. To get evenly sized rolls, use a strip of unflavored dental floss (or a sharp knife) to cut the dough log in half. Then cut if half in half. Last, cut each of the quarters into thirds. You should end up with 12 rolls. Arrange the rolls in the prepared baking pan (or place 6 rolls into each of the square pans). At this point, you may also securely cover the rolls (I used press & seal) and place in the freezer. Cover the pan lightly with a damp kitchen towel and proof for 30 minutes. Meanwhile, preheat the oven to 350 degrees F.
Once the rolls are light and airy, place then into the preheated oven and bake for 20-30 minutes or until the tops are deeply browned. 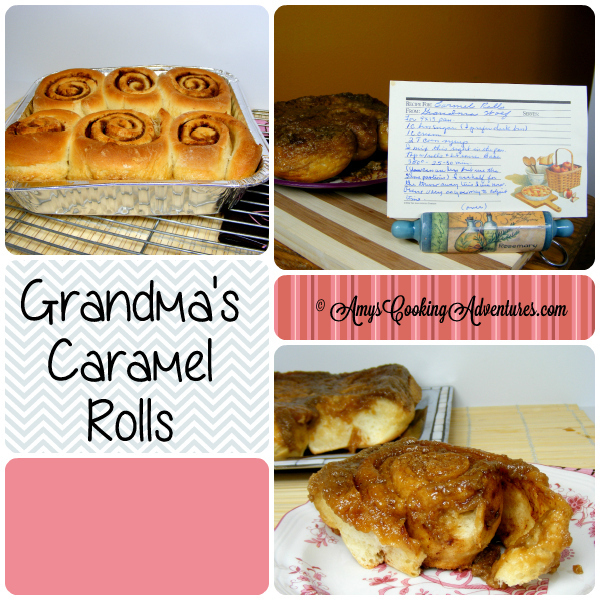 Remove from the oven and invert the caramel rolls onto a serving platter. Serve warm. Take the covered pans out of the freezer. Place the pans, covered, in a warm area (I used the proof function on my oven) for 2-3 hours to thaw. As the rolls thaw, they will also rise. Preheat the even to 350 degrees F.
aww that's so sweet that you got this recipe from your grandma-these look delicious! This looks amazing! Stopping by from Kelley's Financial Friday! Sounds amazing, thanks for sharing! Found your blog through the Sundae Scoop link party, new follower from Sarah Lynn's Sweets! Oh yum! These look great! I love family recipes too! They are the best! Thanks for linking up to Financial Friday! Im going to feature this on my all breakfast site launching soon!